Zion Market Research has published a new report titled “Peptide Therapeutics Market by Route of Administration (Parenteral, Oral, and Others), by Type (Innovative and Generic), by Type of Manufacturers (In-house and Outsourced), by Type of Molecule (Vasopressin, Somatostatin, Calcitonin, Immunopeptide, Natriuretic, and Others), by Technology (Liquid Phase, Solid Phase, and Hybrid Phase), and by Application (Cancer, Cardiovascular Disease, Metabolic Disease, Respiratory Disease, Infectious Disease, and Others): Global Industry Perspective, Comprehensive Analysis and Forecast, 2017 – 2024”. According to the report, global peptide therapeutics market was valued at approximately USD 23.05 billion in 2017 and is expected to generate revenue of around USD 43.26 billion by the end of 2024, growing at a CAGR of around 9.41% between 2018 and 2024. The peptide is a type of selective signaling molecule which binds to the cell-specific surface receptors or ion channels which helps to trigger the response for different functions of the cell for specific diseases. Due to the rapid increase in research for peptide therapeutics and an increase in the awareness levels about them is mainly fueling the growth of the peptide therapeutics market. Peptide therapeutics market is segmented on the route of administration, type, type of manufacturers, type of molecule, technology, and application. Based on the route of administration, the market is divided into parenteral, oral, and others. The oral segment is anticipated to show the fastest growth rate, but parenteral segment dominates the route of administration segment. The easy availability of peptide drugs in the form which can be administered through parenteral route is fueling the demand for the parenteral segment. On the basis of type, the peptide therapeutics market is further segmented into generic and innovative. The increase in investment by many pharmaceutical companies for the development of new drugs is fueling the demand for the innovative type of peptide therapeutics. Type of manufacturers includes in-house and outsourced segment. The in-house manufacturing segment held the largest share of the manufacturer type segment. Stringent regulations in different regions are anticipated to impact the growth of the outsourced manufacturing segment. Based on the type of molecule, the market for peptide therapeutics is segmented into natriuretic, somatostatin, vasopressin, immunopeptide, calcitonin, and others. On the basis of technology, the market for peptide therapeutics is further segmented into the liquid phase, solid phase, and hybrid phase. The liquid phase is anticipated to dominate the peptide therapeutics market due to the increase in the demand for the pure peptides which can easily be obtained through the use of liquid phase technology. The application segment includes cancer, metabolic disease, cardiovascular disease, infectious disease, respiratory disease, and others. The cancer segment is anticipated to dominate the application segment of the market for peptide therapeutics. The rise in death rate due to cancer and the increase in research activities for treating cancer patients are some of the major factors fueling the use of peptide therapeutics for cancer treatment. Europe, Latin America, North America, Asia Pacific, and the Middle East and Africa are the regional segments of the global peptide therapeutics market. North America is anticipated to dominate the market in the forecast period due to the massive use of peptide therapeutics as a drug to treat cancer and various diseases along with the meteoric & rampant use of these drugs. The rapid increase in the geriatric population base prone to chronic diseases and rise in the awareness levels pertaining to peptide therapeutics are projected to fuel the growth of the European peptide therapeutics market in the coming years. Over the forecast period, Asia Pacific peptide therapeutics market is expected to exhibit the highest growth due to the rising government and private investments in biotechnology & pharmaceutical industries operating in the region. The rise in the awareness about the peptide therapeutics and development of new drugs are some of the key reasons that are likely to foster the growth of the peptide therapeutics market in the ensuing years. Latin America & the Middle East and Africa are expected to show slow growth rate in the forecast period. 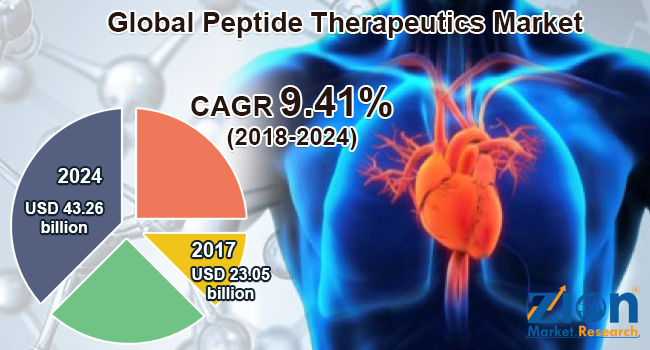 The rapid adoption of the western lifestyle which increases the incidences of heart-related diseases is fueling the growth of peptide therapeutics market in this region. The main players in the global peptide therapeutics market are Amgen Inc., Pfizer Inc., Eli Lilly and Company, Teva Pharmaceuticals Industries Ltd., Lonza Inc., Takeda Pharmaceutical Company Limited, Bristol-Myers Squibb, Sanofi, AstraZeneca PLC, and Novartis AG. The key companies focus on the development of new peptide drugs for treatment for various diseases.